Once purchased your voucher will be ready for pickup at Exige, within 3 business hours; 10 am – 7 pm daily (see description tab). We do not offer at this time the option to deliver the voucher on your behalf. Safely and conveniently purchase Gift Certificates starting at $100. Voted #1 Spa by Tripadvisor, our customers have made us their favorite massage therapy destination in Calgary ! Buy in total confidence knowing you are sending your guest to the only spa recipient of the “Certificate of Service Excellence” two years in a row, by Tripadvisor. Call or text (403) 918-8936 with your voucher # to book an appointment. Looking for a beautiful physical voucher? 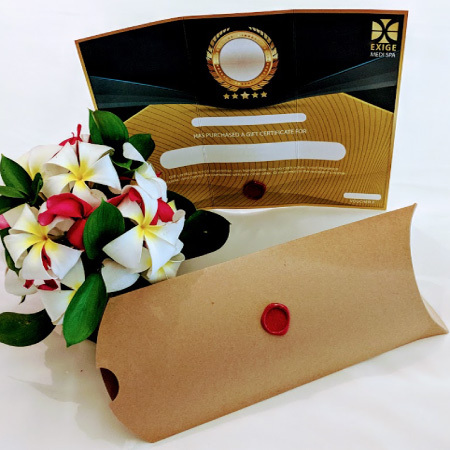 Our physical massage Gift Certificates look fantastic and are perfect for every occasion, whether it be for someone special, a reward or a last minute gift! Once purchased, your voucher will be ready for pickup withing 3 business hours (10 am – 7 pm daily). Your voucher will be ready for pick-up from 10 am – 7 pm at our main branch, located #6, 110 2 avenue S.E., Calgary, Alberta, T2G-0B3 (click here to view on Google Maps). Click on driving directions to get step by step instructions to the spa (enter your starting address). If you need further assistance please contact us at (403) 918-8936. Only purchase after reading our “Terms Of Service“. Your online purchases are completely secure and feature customer 128-bit SSL data encryption protection.